The feared King of Evil and wielder of the Triforce of Power returns to Project M with the amazing strength he inherited in Melee, though some parts of his Brawl moveset return, as well, such as the reintroduction of Flame Choke, his new side special from Brawl. 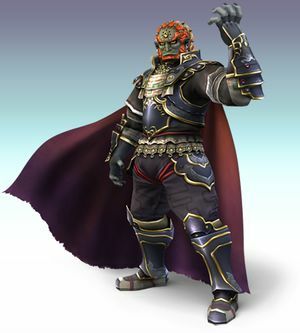 As expected, Ganondorf is the heavyweight powerhouse he was in Melee, being extremely powerful and one of the strongest fighters within the cast, boasting massive power in the majority of his attacks. Aside from his power, he also has among the best reaches as a result of his size and height. With his tremendous power and reach, he is capable of demolishing. Arguably Ganondorf's biggest strength is his edgeguarding game. Ganondorf's down aerial is arguably his most popular move in his moveset, as it is the strongest meteor smash in the game. On top of that, Ganondorf is also equipped with a new neutral special known as the Dead Man's Volley & Drift. This move acts as a reflector against projectiles, thus addressing Ganondorf's weakness against projectiles he had in previous installments of Smash; when used in midair, however, it has access to one additional ability: it can allow him to temporarily float, slowing his falling speed, which is a handy tool that benefits his recovery, especially when used alongside his aerial Wizard's Foot. This page was last edited on 15 April 2016, at 15:17.